Sherlock Holmes has just uncovered the truth about the theft of a priceless ruby. The wealthy Lady Damury staged the theft and tried to frame her husband – but just as Holmes reveals the truth, Lady Damury is found murdered. Holmes deduces that this is no crime of passion, but the work of a ruthless killer with no connection to the jewel. With reports of a man in a strange, trance-like state, Holmes finds himself entangled in a dangerous game of cat and mouse with the sinister Dr Caligari. 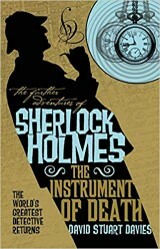 Marketed as ‘the further adventures of Sherlock Holmes’ by an acclaimed Sherlockian author, it’s fair to say that this book is written ‘in the style of’ the original Conan Doyle stories. It however has a decidedly modern twist, despite being set in 1896. For starters, the book is only partly written in the style of Dr Watson’s journal, with half of it being written from the point of view of the villain, Dr Caligari. There is also far more graphic violence than you would find in the original Sherlock Holmes stories, and a psychopathic villain who just seems more visceral, in terms of villainy, than any foe Holmes dealt with in the Conan Doyle narratives. There is also a strong-willed female character in the form of Ruth Marshall, an actress targeted by the killer who proves to have a somewhat keen survival instinct, and manages to fight back. Although she is only a secondary character, she is a welcome addition to the modern retelling of Sherlock Holmes, as the original novels were conspicuously lacking in strong female characters, as was most fiction of the era. In a world that has given us contemporary retellings of the Sherlock Holmes stories in TV series such as “Sherlock” and “Elementary”, to give a modern slant to the stories (whilst keeping them in the original Victorian setting), has to be no easy challenge. I think in this novel David Stuart Davies has succeeded in creating a story that would please most Conan Doyle fans, whilst still appealing to a more contemporary crime fiction reader.